Over the past few weeks we have discussed some of the most common types of deeds used to transfer ownership of real estate in Florida. 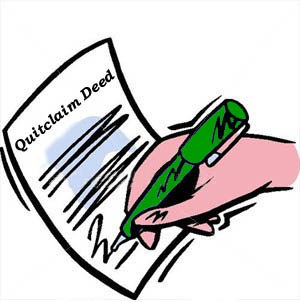 One of the most common deeds is that of a “Quitclaim” Deed; it is not “Quick Claim,” or Quit Claim.” The proper legal term is “Quitclaim”, one word. Recall from previous discussions that General/Special Warranty Deeds make certain “covenants” (guarantees) as to the quality of title that is being transferred: grantor (seller) owns the property and has the right and authority to convey (transfer) it, title conveyed is superior to all others, there are no other defects, encumbrances, or liens other than what is stated in the deed, and that the grantor will step in and defend against any lawful claim made against the title. In contrast, a Quitclaim Deed does not include any guarantees. A QCD only provides that if the Grantor does own the property, then they are transferring any ownership interest they have to the Grantee. It makes no assurances that the seller even owns the property they are selling! However, there are certain instances where a Quitclaim Deed is not only acceptable, but preferable. When typically is a Quitclaim Deed used? Often, a QCD is used to cure defects or issues with a property’s title. In that sense, a quitclaim deed is used as a type of release. So, if there were any clouds on the title, a Quitclaim Deed could be used to have that individual “release,” so to speak, any potential interest or claim they may have. In upcoming blogs, I will discuss having “Marketable Title”, and how these “clouds” can affect a real estate transaction. Suffice it to say for now, these “clouds” can affect not only on the value of the property, but also on the ability to get financing, title insurance, and closing. Another common use of a QCD is where a spouse is added or removed from a deed. FL has certain laws in place to protect spouses and minor children, so I urge you to speak with an attorney before attempting this yourself. However, this situation can occur when property is transferred to an ex-spouse as part of a divorce. It is also useful when adding a new spouse to the title after marriage. Also, parents can use a QCD when they transfer their property interests to their children. Lastly, attorneys use a QCD to transfer property into a trust, to an heir, to a business owned by the grantors, and numerous other situations. In summary, quitclaim deeds are often quick fixes to “cure” clouds on titles during real estate transactions. Even though Quitclaim Deeds are not the preferred document to use when you buy a home, there are plenty of necessary and practical uses for them in today’s legal arena. It’s worth repeating that when buying or selling real estate, it is imperative you know what type of deed will be used in the transaction and verify its inclusion in any purchase or sale agreement. This is a generalized discussion on Florida Deeds and is not intended for any particular set of facts. By no means does this blog create an attorney-client privilege between the Attorney and the readers. If you are considering buying or selling real estate in Southwest Florida, you should speak to a licensed Florida Attorney. If you have any questions, comments, or suggestions on upcoming topics, please comment below or email GuirguisLaw@gmail.com. Posted on May 9, 2012, in Legal and tagged Attorney, Buy a Home, Closing, Divorce, Financing, General Warranty Deed, Grantor, Heir, Lawyer, Legal Schmegal, Marketable Title, Quitclaim Deed, Special Warranty Deed, SWFL Real Estate, The Guirguis Law Firm, Title Insurance, Trust, Vernon Guirguis. Bookmark the permalink. 4 Comments. Hello there,You’ve done a great job. I will definitely digg it and personally recommend to my friends. I’m confident they’ll be benefited from this web site. A Quitclaim deed is commonly used when several members of a family own a property. You may find that the seller or property agent presents you with a quitclaim deed or you may have been advised to ask for such a deed. Your insurance company, with whom you are looking to insure your new home, might also require this deed. It a commonly requested deed.